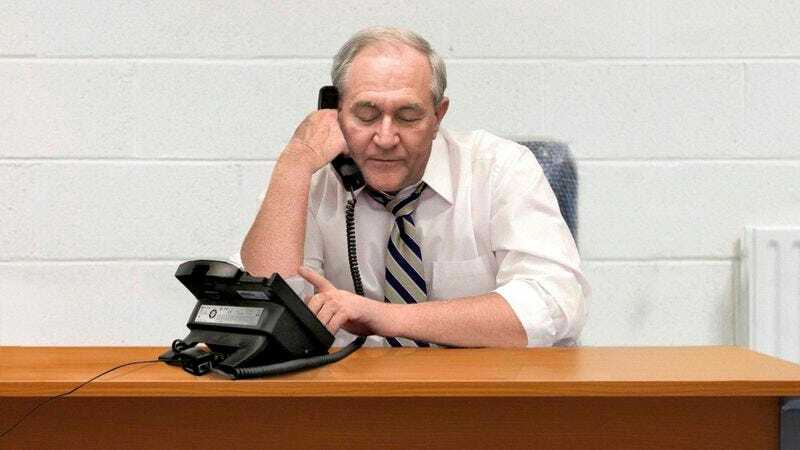 DES MOINES, IA—Sitting by himself behind a computer desk in an otherwise empty rented office space, former Virginia governor and current Republican presidential candidate Jim Gilmore reportedly answered a phone call Sunday by raising his voice to a high-pitched vocal register and asking the caller to hold while he transferred them to Mr. Gilmore. “Just one minute, please,” said Gilmore in a feminine falsetto before approximating the sound of an electronic beep with his voice and then holding still for several moments. “I apologize for the wait; Mr. Gilmore is a very busy man. We’ve been completely backed up all morning. If I can’t get in touch with him, would it be okay to have him return—oh, wait, you’re in luck, here he is. One second…. Hello, this is Jim.” At press time, Gilmore was explaining to the person on the other end of the line that the law office of Cafferty & Sullivan had moved out of the building several weeks ago and was now located over on Union Street.